The rustic scene depicted in this post card from circa 1917 shows Long View Park as it looked in the early 1900s. A nationally known landscape artist from Chicago, O.C. Simonds, is responsible for the original design of the park. Known for his naturalistic design emphasizing the natural beauty of the land and native plantings, his design style was perfect for Long View Park and its long sloping hillside. For half a century the hillside area was know as Bailey’s pasture. It was part of the estate of Bailey Davenport, son of Colonel George Davenport. Bailey invested in acres and acres of land and he retained ownership of this land until his death. As the City of Rock Island grew, his vast holdings, including his home and this pasture, were surrounded by development. After Bailey’s death in 1890, the land was sold at auction to a group of businessmen who intended to resell the land to help their city grow. Rock Island Mayor Thomas Medill approached the group, convincing them to donate the land for use as a city park. The donation was completed in 1897, with the stipulation that the land be used for a city park and that no intoxicating liquors ever be sold on the property. The forming of Long View Park was the first time the city of Rock Island set aside land for the beautification of the city. And citizens were involved in the development of the park from the beginning. Community members joined together to form an Improvement Association and solicited ideas for names for the new park. Long View was the chosen name. Notice the spelling. It was originally written as two words, but over time evolved into one. One of the first projects undertaken at the park was the removal of the fence around the park in hopes that people would not think the area a pasture and turn their cattle out there. The Improvement Association also engaged the services of O.C. Simonds. With donated lumber and volunteer labor the association cleared dead timber and built a tower to be used to take aerial photographs to aid in his design plans. One hundred ninety citizens donated money in denominations from $10 to $150 raising $12,500. This money was matched by the city council and park improvements began. Winding drives were constructed through the park to allow people to enjoy the natural beauty of the area. Two lagoons were built on different levels connected by a small brook. A waterfall and a series of dams were part of the water course ending in the lower lagoon that contained an “island jungle” in its center where ducks and swans lived. Land shaping was done to make a series of gentle slopes descending from south to north, walks were laid out and shrubbery was planted. Man-made structures were added as well. A large fountain was donated by Misses Naomi and Catherine Davenport in memory of their uncle, the original property owner. A white band shell and white benches were added. And rustic twig bridges as seen in the post card here were built along the water way. Under the personal direction of park commissioner Chris Gaetjer, a trial garden was started in the southeast section of the park. Thousands of seedlings from other parks and city properties were planted along with annuals and perennials. 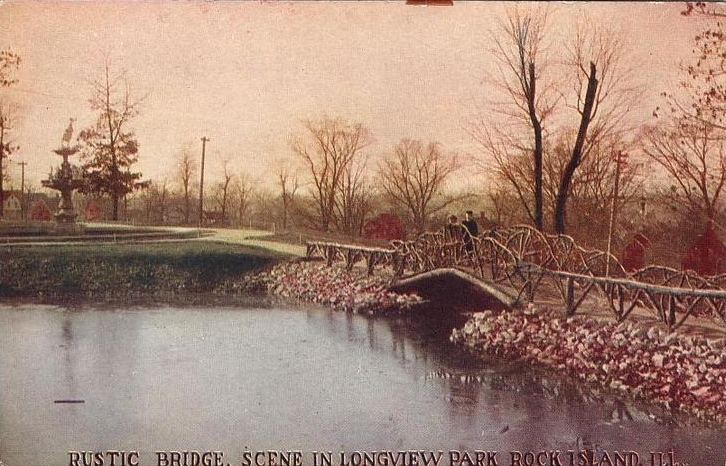 On July 10, 1908, Long View Park was formally dedicated. The day was observed as a holiday in the city. Mayor H.C. Schaffer requested merchants to close their stores for the afternoon in order to give their employees an opportunity to participate. Fifteen thousand people attended the exercises that were held both in the afternoon and evening at the park. During his address, Park Board president William Jackson described Long View Park as a “place of rest for older people and a place of utmost pleasure for the children.” A fireworks display concluded the festivities of the day. Over the next decades, additions to the park have been made including the building of the Chalet on Stag Hill in 1917. that was used for parties and dining. The jungle island was removed from the lower lagoon making way for winter skating. The upper lagoon and bandstand were replaced by a public swimming pool. Playground equipment, a greenhouse and a conservatory were added. But during those years no major reshaping of the park land itself took place. This article, by Linda Anderson, is slightly modified from the original that appeared in the Rock Island Argus and Moline Dispatch on July 15, 2001.